Many people consider dining room the most important place in the whole house. Why is that? Because it is the very room, where families gather together and spend most of the time all in one space. Which means dining rooms should be warm, cozy, comfortable for every member of the family to feel great. The place we sit on has a lot to do with that feeling of comfort. Here are a few reasons why you should go for acrylic dining chairs for your home. Transparent acrylic dining room furniture units are perfect when it comes to creating special atmosphere in a room. They are light, completely transparent, and airy. They look like glass, but can withstand any kind of damage due to their durability. Because of their shatter resistance, they are ideal for dining rooms , especially if you have kids and pets. These chairs are less bulky as they seem to take up less space than the usual ones because they let all the light go through them. They are ideal for any décor! Mixing and matching different styles is one of the most popular trends nowadays and modern acrylic dining chairs are perfect for just that. If you have a big wooden table which is a bit bulky, it would be a great idea to pair it with elegant acrylic dining chairs that will balance out the whole look and create a more cheerful and stylish feel in your dining room. The ultra-modern look of dining chairs can be mixed with elegant vintage furniture pieces or paired with rustic tables. They can even be mixed with industrial metallic items made with wrought iron. Possibilities are endless when it comes to these modern chairs. Plexiglas dining chairs are transparent, but it doesn’t mean they are colorless! Acrylic dining chairs come in a variety of hues like light pink, blue, green and others. Which means you have endless possibilities to experiment with your dining room design. Although the overall design of these chairs is modern, they have different shapes that look more classical or even vintage. This versatility makes them really flexible and universal for all dining room designs. To make these seats more comfortable you can use cushions or pillows as acrylic chairs usually don’t have any upholstery. 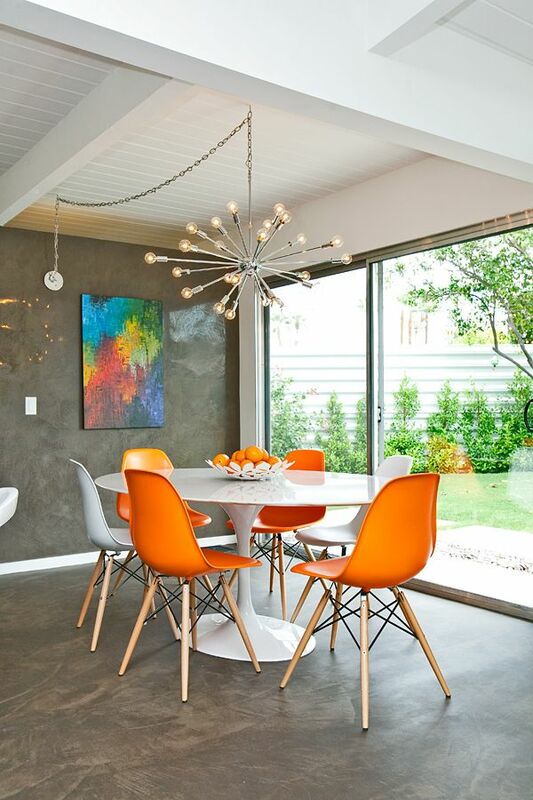 Acrylic dining chairs are a perfect choice because you can use them with any color palette. Whether you have a cold or warm color theme – you can fit them in easily! They are also great if you a have a lot of going on in your dining room design-wise. If you floor is patterned and you have some art on the walls it’s good to have some lightness and transparency that will help to tie everything together without adding any color that will make the design even more heavy.